The first question is what is PG/VG? VG (Vegetable Glycerol) = Produces almost all the vapor. It’s a thick liquid with a very slight sweetness. 100% PG E Liquid – The secret strong vape! Our 100% PG e liquid produces hardly any vapour so you can vape in settings where you normally don’t want to be seen blowing out clouds of vapour. 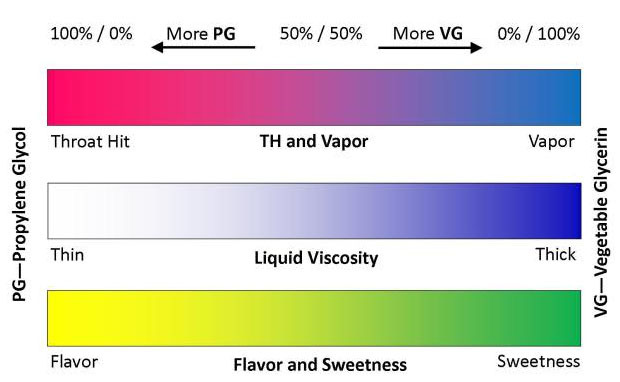 The flavor is carried better in PG, (some people say VG is better for flavor but this is not true - check it out on Google, the more VG - the more muted the flavour will be). The throat hit is strongest in 100% PG e liquid blend so its definitely not for the faint hearted (too strong for me). 70% PG / 30% VG E Liquid – 70%PG / 30% VG mixture is the standard across the board and what The Vape Shop produces nearly all of its e liquid range in. It’s got a good strong flavor with a decent throat hit and has a decent vapor production and moisture added by the 30% VG. RECOMMENDED FOR NEWBIES. 50% PG / 50% VG E Liquid – A lot of vapers prefer the 50/50 mix as it has the best of both worlds equally. You will still get a mild throat hit but with plenty of vapour production. You will have a lighter flavor undertone and you may also detect a slight sweetness to the vape as well. 30% PG / 70% VG E Liquid -The Vape Shop’s 30% PG / 70% VG is a moist cool vape that will produce great big clouds of vapour. The throat hit and flavor strength enhanced by the PG however will NOT be so potent - so this mix is really one for vapers who prefer large vapour production and are not so interested in a strong throat hit or intense flavour. (You will still taste the flavor but not as potent as a 70PG/30VG mix). 100% VG E Liquid – 100% offers huge cloud-like vapor production combined with a cool moist vape, slightly dumbed-down flavor and very little to no throat hit. Syrupy consistency and may not work well in certain atomizers. WARNING: By adjusting the PG/VG percentages to suit your own requirements you will affect the flavor and e liquid performance.